WAIT WAIT WHAT ARE YOU DOING oh okay. Michigan played Notre Dame for the last time at the Big House for an undetermined amount of time, as the rivalry is going on hiatus after next year due to ND deciding they'd rather play a bunch of ACC teams, Michigan State, and Purdue instead. At any rate, Michigan won in another classic, although this was a little more comfortable to watch than the past few years. One of the big stories was how well QB Devin Gardner played, including one scoring play in the first half where the play clock almost expired before the ball was hiked and Gardner ran it in himself. So yeah, the game was fun. I was worried that I shouldn't stay up what with having a newborn and sleep being a premium and all, but it was worth it and she actually slept in my arms as I watched. What, you want non-Michigan content? FINE. This is the time of year when many churches--particularly mainliners--have Rally Day. It may be called something different, but the gist is the same: it's the big kickoff of the church program year, particularly Sunday School and other educational events. My church had it this past Sunday, and even though I wasn't there (paternity leave), reports are that it went well. If we take seriously our commission to make disciples of all nations, we can’t be congregation-centric. 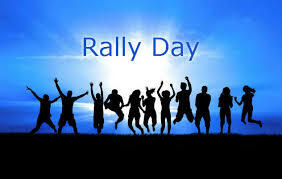 A new kind of Rally Day seems to be called for. (fire fighters, police officers, EMT volunteers.) This works well in terms of a positive 9-11 remembrance. Invite all the local First Responders to a party in their honor in a grocery store parking lot or a very public local park. Get local businesses to donate things (moon bounce? popcorn machine? smoothies?) and approach others to donate gift cards to give to those who protect your community – who are probably either volunteers or paid very little. One church I know gives $100 grocery store gift cards to each of their local First Responders. with 3-5 pre-planned opportunities for serving the community. After gathering at the church building, individual teams then choose one project and then leave to go serve as a small team by weeding a community garden, picking up trash on the highway, visiting a nursing home, serving dinner in a shelter, making sandwiches for volunteer fire fighters. Something for everyone. Rally Day as a massive community Love Bomb. The point of all this is basically to get out into the community. See who’s out there. Who are they and what do they need? I do know of churches who have done stuff like this before, not necessarily specifically for Rally Day, but as a way to get out of the building and into the world. Likewise, I don't think these need to take the place of Rally Day. They could instead be the sorts of activities that we psych ourselves up for during that initial celebration, sprinkled throughout the year. So rather than rethink one event, we'd be rethinking what the event is kicking off. Tomato-Tomahto, perhaps. I don’t care if you sing about Jesus or God. I don’t think Jesus gives a sh** if you believe in him or not. I think Jesus wanted to convert us to a way of life, not to a system of belief. I think Jesus cares that I want to help and support you, and that you want to help and support me, and that we want to do that for everybody we meet, with no exceptions. But I know we don’t have time for that, and I didn’t have time to think it clearly anyway, and so we do our awkward step-and-shuffle with the exchange of $20, which I tell him I hope he will use in some way that contributes to his well-being. He starts telling me about how he has a dream for his life and something about rehab but his eyes are dead — this is a practiced recitation — and I interrupt him. “No, no, you don’t need to explain anything. I’m just telling you what I hope for you, okay? It’s just what I hope for you. That you take care of yourself. Okay?” And I walk on. Good Lord. For a twenty buck hand-out he thinks he owes me a college application essay? Please. Honey. Just go. I know this little routine between potential giver and receiver. It's not always a song on the street, but the basic elements of having a story, reeling someone in, skepticism on the giver's part, giving anyway, profuse thank yous after the fact. It's not that one shouldn't help or should always suspect the other. It's just the deception of the whole thing, the rehearsed nature, the manipulation, the lack of honesty on the part of both about what each really needs to do. It's easier to just exchange money and leave it alone, but it doesn't get either of us any closer to transforming the situation. Misc. Black Coffee Reflections on when churches seek volunteers. Brant Hansen on the infamous Miley Cyrus MTV performance. Sure, it's been a few weeks now, but what's one more take on it? Rachel Held Evans reviews Nadia Bolz-Weber's new book Pastrix, which I preordered and devoured in two days. I'm debating whether to post a review of my own.